So, now that you all know that Cuddles actually popped the ol' question... I bet you want to know what ring he chose. 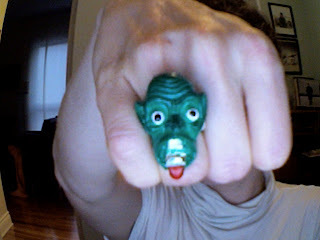 Well, here it is, the ring that made me think, "YES! I am definitely and positively in love with you"
Warning : do not stare directly into the eyes, I think bad things might happen. Sorry for the crappy pic, it's from the "photo booth" option on the Mac, which is fun, but sucky. The flash makes the ring look a little scarier than it is, and please note the rhinestone (courtesy OOTG apparently) that is double-sided taped to its tongue. HEART. wow. I'm telling Mr. Sparklepants (aka my husband) asap... this ring makes my glow in the dark resizeable ring from the dollar store seem so.. so.. ordinare!!! Love the color. Brings out the green in your um... Well, the green compliments your skin tone nicely. That is awesome!! I think I'm in love with him too. If Mr. PK had actually thought about proposing to me before he did, well, I hope he would have had the good sense to put an ol' quarter in one of them machines at the rest stop, and get me a comical plastic ring too. 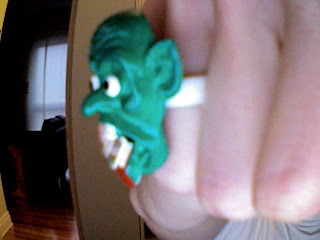 Allow me to assure you that the ring IS that scary in real life. Cuddles is definately a keeper. Thanks OOTG, for backing me up here. I think it's more funny than scary in person, but then, OOTG scares easily. watch this : hey OOTG : snakefish! PS thanks hick for keeping our 5 cents alive.